Christmas is just around the corner and I bet most of you will be baking at least one batch of cookies. It doesn’t matter if they are sugar cookies, gingerbread men, or snicker doodles. It doesn’t even matter if they are made from scratch or out of a refrigerated package or a box mix. When Christmas arrives, there had better be cookies. (I mean, you do want a visit from Santa. Right?) Yes, Christmas is definitely cookie season. The Dutch were big cookie fans. In the 1600s, the Dutch and German settlers in America were known to make lots and lots of cookies at Christmas time. But, I’m getting ahead of myself. As cookies became popular around the world, bakers experimented with ways to shape and decorate them. Imprint-type cutters were made by the Dutch, Germans and Italians. These hand-carved molds can be mini works of art, featuring birds, flowers and all kinds of animals. Imprint cutters were followed by outline cutters, and by the 1400s, cookie cutters were in every kitchen. Outline cutters are the cutters we are most familiar with today. First in Europe, and then later in America, itinerant tinsmiths created all sorts of shapes and sizes of cutters from scraps of tin. The most iconic of these shapes are gingerbread men. Gingerbread men date back to Elizabethan England, where, it is said, that Queen Elizabeth I (Henry’s daughter, not Prince Charles’ mum) was quite fond of gingerbread cookies. She would often present her guests with gingerbread cookies made in their likeness. As immigrants flooded into America, they brought with them their culture and customs including gingerbread cookies and cookie cutters. By the 1800s, tin cookie cutters were being sold from shops, as well as from peddlers, and by the turn of the century. cookie cutters were being mass produced, making them so affordable that housewives could have different cutters for holidays and everyday use. Cookie cutters could be easily purchased from general mercantile dealers and from catalogues like Sears & Roebuck Co. Some enterprising businessmen took the opportunity of placing ads on cookie cutters. A lot of these tin cutters can still be found in antique shops, or (if you are lucky) handed down through families. Old tin is heavy and thick, and mostly dark colored. They make cuts 3/4 inch or deeper. Tinsmiths tried to save every inch of tin, so the cutters may or may not have a handle. 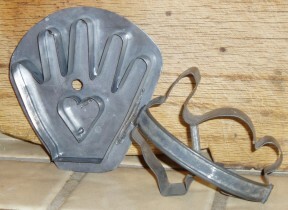 The more unusual the shape, the more collectible the tin cookie cutter is. There are aluminum cutters that date to the early 1900s, but they are more commonly found in the 1920s and 30s. 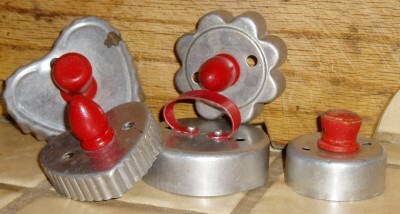 Collectors like these cutters because of the wood or Bakelite handles that came in red and green. 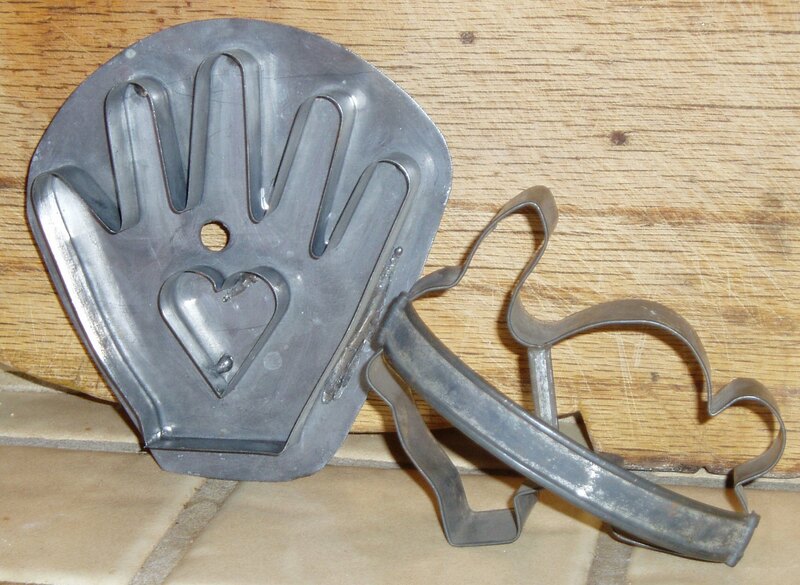 Cookie cutter sets in the shape of hearts, spades, diamonds and clubs were actually sold as sandwich cutters. These can easily be found at thrift stores or yard sales. Transparent red or green plastic cutters appeared in the 1940s. Opaque plastic cutters were available from 1960 through today. All of these cutters are marked “Made in USA”. Some of the cutters that Hallmark produced in the 1970s and 80s are very collectible. Hallmark, one of the top cookie cutter makers along with Ekco, produced hundreds of cutter designs for every conceivable occasion. I probably bought 50 or more of these cutters at Otani’s Variety Store on I Street (now the home of Reedley Trading Post) during the 1970s. Cookie cutters that have a firm name or logo on them are very collectible, as are cutters that are cross collectible (like Batman for example) and cutters that commemorate a particular event. According to ecommerce.com, a plastic 1999 Domino Sugar cutter in its original package recently sold for $132.50 at an online auction; a 1989 Wilton Batman cutter sold for $40.99, and a NASA Voyager Mission cutter and recipe card garnered a final bid of $306.00! And then there is Martha Stewart. I mean really, can you imagine that the queen of good things wouldn’t be marketing cookie cutters? Martha’s are made of copper and, again according to ecommerce.com, are regularly bringing in $200 to $300 dollars at online auctions. That’s a log of (cookie) dough! And then there are gingerbread cutters. Collectors love these cookie cutters because of the huge variety of cutter types available, and the nostalgia factor. We all remember the Gingerbread Man and the part that gingerbread played in Hansel and Gretel. A little side note here. Did you know that the Grimm fairy tale may have been based on a true incident? Hansel and Gretel may not have been the sweet, innocents portrayed in the story, and the witch might have been the real victim! For the truth check out cookiecuttersearch.com/HanselGretel-2.htm. As usual, a word of caution when buying something “old” that you may not be sure of. Modern manufacturers are making reproduction cookie cutters in all materials. My motto when buying, is to only buy it if you really, really love it. I do have a couple of reproduction tin cutters in my collection because I liked the subjects. I also try to stay away from cutters that are not made in the U.S.A., but again, if you love the cutter why not buy it? There is actually a National Cookie Cutter Historical Museum, supported by (whom else?) the Cookie Cutter Collectors Club (CCCC), in Joplin, Missouri. The CCCC shares research information about cookie cutters and sponsors National Cookie Cutter Week (the first week of December), which opens up the biggest cookie baking and decorating season of the year: Christmas! I keep my collection of cookie cutters in an old pickle jar on my kitchen counter. I like seeing them everyday–they bring back happy memories of baking with my Grandmother, Mother and my two girls. Most of my cutters are from 1910 through the 1940s, although I have several heart shapes that are new. 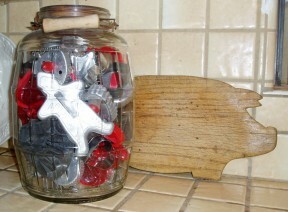 I also have all the transparent red cutters my mother used in the 1950s. I have especially fond memories of the red Santa Claus and my mother (a school room-mother) making hundreds of hand-painted Santas for my two brothers and I to take to school. That’s right, she actually used a paint brush to apply the frosting for the red hat and the white beards. Red sprinkles went on the hat and the beards got cocoanut. There were Santas covering every flat surface in our kitchen! Another memory from my childhood was the Christmas Eve when we came home from church to find that our Siamese cat had licked off all the frosting on the decorated sugar cookies Mom had set out on the dining room table for a treat when we returned home. Okay, I’ve got to wind this up for now. I feel the need to bake and decorate some cookies. Merry Christmas to you and happy cookie cutting.